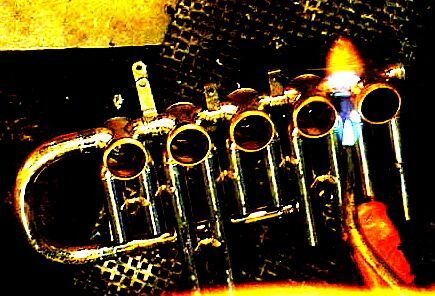 This picture was taken about three or four years ago, The valve cluster became one of the Sansone design 5V Bb horns. These horns began with a Yamaha 321 and had an added Fifth valve beyond the #3 valve. Generally I used either a #1 or #3 valve from a Yamaha 313 horn. Under the flame you cannot see the third spatula bar support ferrule. The Sansone ‘globe ‘ was fashioned from an altered, to the proper length for the F extension, Eb slide from a King or some other horn with a rounded Eb slide. I made them from both .464 and metric tubing and, quite frankly, if I they got mixed up could not tell by the sound produced, w/o measuring to identify which was which. The spatula bar was extended in one of two ways. One created a fourth space, same as the other three openings, silver soldered on to the original bar. This required a new Spatula rod of the correct length (I used Motorcycle or Bicycle tandem spokes of the proper diameter and threaded to the metric thread pitch of the Yamaha rod nuts. The other was a separate pair of posts w/ openings for only the fourth spatula. This allowed me to use the factory spatula rod, threaded into the outside #3 post from the mouthpiece side and a separate short rod threaded into the Mouthpiece side of post, so Two spatula rods were used, one factory and one short one with screwdriver slots cut in the non threaded end. They did not use the Yamaha rod nut, but were screwed in ala a Conn spatula rod with a fine screw driver. If I can find pix I’ll post them in the future.